Home Valley Station is located on the famous Gibb River Road, at the foot of the majestic Cockburn Range. 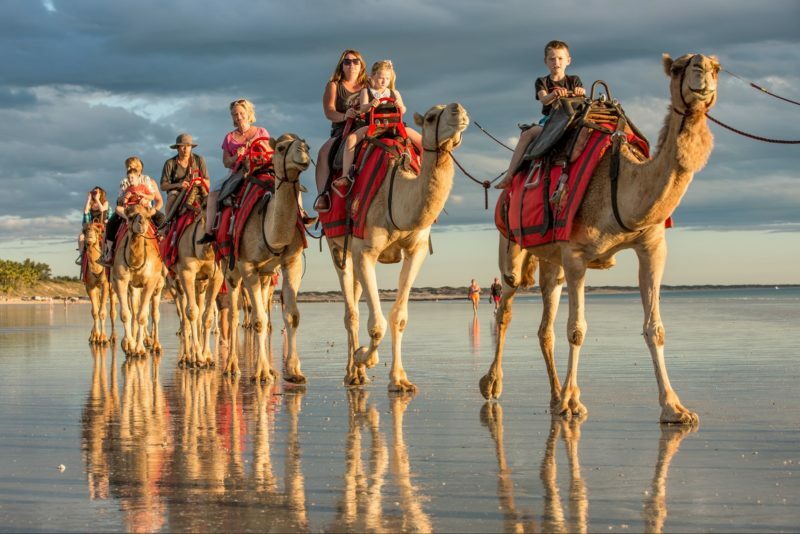 It is engulfed by a landscape of breathtaking contrast, where travellers experience a humbling connection with an ancient, largely untouched land. Experience the exhilaration of Barramundi fishing on the Pentecost River or enjoy the tranquillity of swimming in natural sapphire pools dwarfed by ancient red gorges. Soak in the unforgettable scenery and be inspired by the spirit of the region’s indigenous Aboriginal people. At Home Valley Station they pride themselves on providing guests with the ultimate Australian outback experience. Accommodation across the Station provides options for travellers – from those who prefer a rugged outback adventure with a twist of luxury to those seeking a more intimate experience. Home Valley Station is 120 kilometres from Kununurra along the Gibb River Road. Guests can also fly directly to Home Valley Station, landing at their all-weather airstrip. Home Valley Station looks forward to welcoming you! 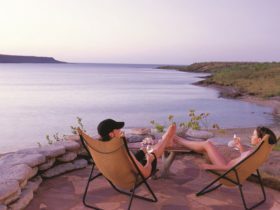 Combining guest comfort with an intimate experience of the Kimberley and all its natural treasures. Eco Tents are extra large safari-style tented cabins (five metres by six metres) featuring pitched roof tops, queen size bed or two single beds, and large canvas windows on all sides which can be fully drawn back at night to reveal a stunning blanket of Kimberley stars. There is no television or phone. 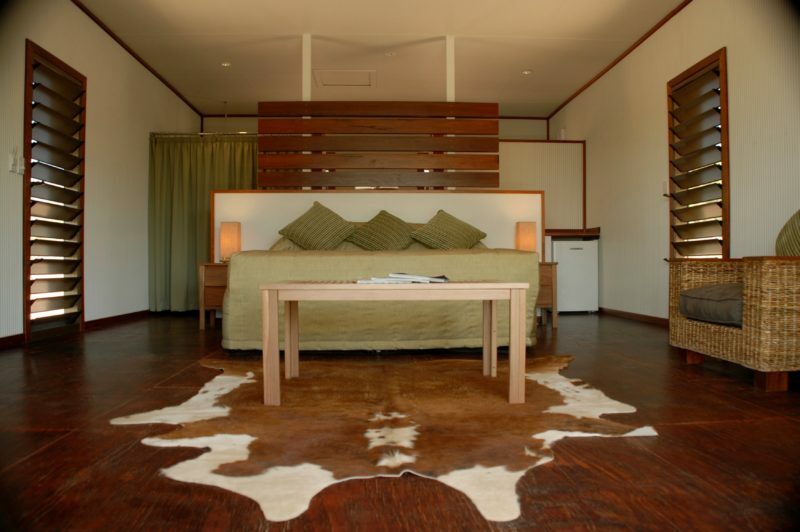 The private tented cabins also contain timber floors, timber furniture, power, lighting, fans, and private timber deck looking onto the magical Kimberley landscape. Bathroom facilities close by. Rooms serviced daily. 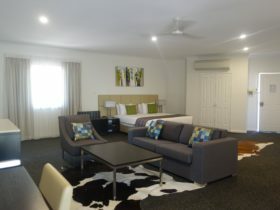 Maximum of four guests per room. Children under 15 years of age stay free when sharing with parents using existing bedding. Home Valley Station’s Guesthouse Rooms offer visitors an exciting insight into the region’s cattle station history. New buildings may have replaced the original stockman’s quarters, but with sensitive designs and the use of similar materials such as corrugated iron walls and cool concrete floors, the history and authenticity is set to remain. These rooms are moments from Home Valley Station’s famous Dusty Bar and Grill, the irresistible lagoon-style pool, Station Store, and night-time campfire entertainment. Guesthouse Rooms feature high quality king-sized beds, with send-you-to-sleep linen, private bathroom, soft towels, beauty and grooming products, air conditioning, ceiling fan, power, lighting, tastefully appointed furniture and fittings, and tea and coffee making facilities. Rooms are serviced daily. 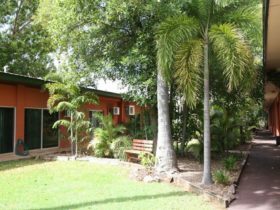 Set at the foot of the majestic Cockburn Range, Home Valley Station is the perfect location to set up camp for those travelling the Gibb River Road. Offering powered- and non-powered sites, the main campground is located close to the Station’s central guest services and facilities, and boasts communal bathrooms with hot showers and fresh water and laundry facilities. 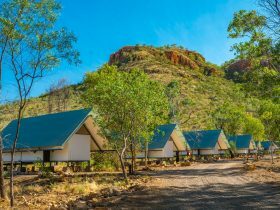 Arguably the most spectacular campground in the Kimberley, the Pentecost River Bush Camp offers grassy non-powered sites right on the edge of the Pentecost River with stunning private views of the Cockburn Range. 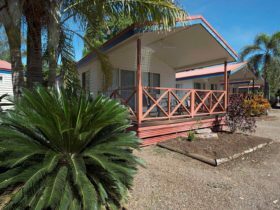 Set four kilometres away from the Homestead, the campground offers clean and modern facilities with hot-water, toilets and picnic shelters. Reservations required for groups of 10 people or more and for powered sites. Generously appointed and idyllically located on the banks of the Bindoola Creek the Grass Castles provide guests with a touch of luxury. Reminiscent of the steel and timber homesteads of the early pastoral pioneering settlers the Grass Castles are free-standing and feature floor-to-ceiling glass doors framing a stunning direct view of the creek below. Rooms are air-conditioned and feature a king-sized bed and boast a private verandah with daybed. An Australian buffet breakfast is complimentary. Maximum two adults, one child per room. Additional roll-away bed for second child extra.